Celerity Managed Services allows customers to offload the operational management of their data protection solution onto Celerity technical resource. We understand the challenges that your organisation faces today. 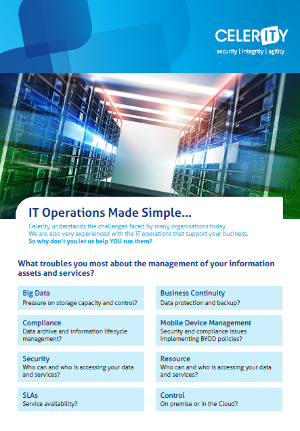 Removing the complexity and pressure from day to day IT operations is what we do. Our team of experienced consultants deliver a range of services that ensure your environment is managed, resilient and safe from both attack and disaster. What is Celerity Managed Services? Our managed service provides flexibility on managed backup environments, removing the operational costs of managing your storage hardware and backup infrastructure. You are able to release your internal resources to focus on your core business matters whilst our vendor certified consultants ensure that your environment and critical business applications are continuously supported, monitored and analysed, all in a flexible package that works for you, and apart from the inevitable cost savings, that’s one less thing to keep you awake at night. “Moving our IT services to Celerity gives us a robust and cost-effective solution that allows us to provide better customer service both internally and externally to the public and to the opticians we regulate. The transfer of our services to Celerity ran smoothly and we are finding them easy and professional to work with”. Celerity understands the challenges faced by many organisations today. We are also very experienced with the IT operations that support your business.